ARRA News Service: The Real American Idol Winner! The Real American Idol Winner! 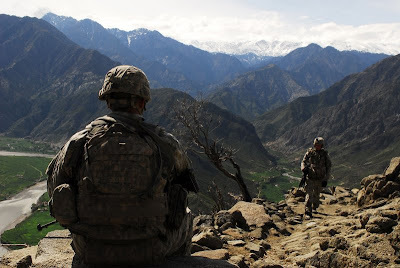 Tags: Afghanistan, American Idol, Marine Corps, Marines To share or post to your site, click on "Post Link". Please mention / link to the ARRA News Service. Thanks! I AM THE PROUD WIFE OF SGT. LEVI BRADSTREAM. MY HUSBAND LOVES HIS COUNTRY AND SERVES WITH GREAT PRIDE. HE IS MY HERO.HE IS ONE OF MANY AMERICAN HEROS. Sara, God Bless you, Levi, Anthony, David, all others who are serving and also their loved ones waiting for them to return. I understand because I served for 22 years and my wife, although not in the military, served with me the entire time. Our Children grew up with the children of other military families. During the Vietnam War, manpower shortages stateside left teh units shorthanded. Often the wives (almost no male spouses back in 1966) would volunteer (no pay) to help with unit paperwork and files. Without good communications between troops in the field and their loved ones back home, they liked to help in hopes of getting word as to what was happening. Sara, my wife and I send our love and prayers. You got that right!!! !God bless the real American Idols. PRAISE THE LORD-someone finally nailed that one on the head! God keep each one in under Your wing! Maybe not idols - but true heros! Amen Brother! God bless America's Heros. I am the proud wife of Spc. Anthony Janda. It is so great to see that our mens hard work is recognized. My husband is my hero in every sense of the word! Mrs. Janda, Thank you for you note and love for your husband. I wrote a previous comment addressing Anthony and the others. I and others are very proud of them. Hope you saw the comment. Thank you, your husbands, and all the rest who honor the call to duty and serve to protect us all. Please know your service and sacrifice will always be honored, never forgotten, by those of us who served before. Your families and those of all our troops are in my family's thoughts and prayers. We are the proud parents of Sgt.Levi Bradstream. I served my country during 1974 - 1977 in the US Army and my husband served in the US Navy from 1973 - 1976. To see our son continue our family tradition brings tears to my eyes (again) and his father's. Levi is our hero and we believe that he is serving his country with honor and integrity. Thank you our son for being the man you are. Your mom and dad are very proud of you and can't wait to see you when you come home. My family has served this Nation from the American Revolution up to the current war. We stand with our Brothers In Arms now and forever.